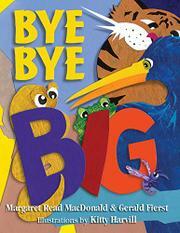 Little ones explore the food chain and make size comparisons in this tongue-in-cheek book. Graphically bold, textured cut-paper illustrations in highly saturated colors are a big draw here. The book opens with a giant green frog on the verso, its eyes swiveled to peer at the little purple mosquito on the edge of the recto: “There was a BIG BIG FROG! And a little little mosquito.” The typeface plays a big part in the tale: “BIG! Little. / BIG! Little” is the only text on the following double-page spread. And another page turn reveals “Bye Bye Mosquito!” Wings stick out of the frog’s mouth, a tone-on-tone outline of the mosquito on its belly. But then, what’s this? All of a sudden the frog is the little animal, a snake the big one. The process repeats through a bird, a tiger, and to a man, who throws a net over the tiger. But then the littlest animal returns to show how mighty it is, and the final illustration shows all the animals tumbling forth as in “The Little Old Woman Who Swallowed a Fly.” Harvill’s pictures are never grotesque or gory, so this is a rather gentle introduction to the way of the wild, though the animals’ eyes can sometimes look manic, and the cover is a bit hard to parse visually.